The key difference between food chain and food pyramid is that the food chain does not give a quantitative measurement while the food pyramid gives an idea of the quantity of food to be consumed. Food is the major source of chemical energy for living organisms. The organisms process the food consumed in order to generate energy for their day to day activities. The representation of energy flow via food intake is therefore very important. In that aspect, the food chain and food pyramid are two important concepts. 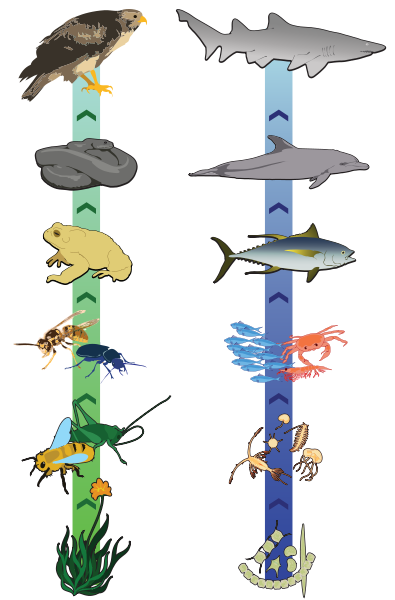 Food chain depicts the linear relationship of feeding in organisms. On the other hand, the food pyramid shows the quantity of food that should be consumed from each food type. 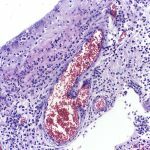 Hence, by studying both the concepts, we can derive nutritional and energy relationships between organisms. A food chain is a linear sequence of feeding patterns in organisms. The food chain begins with the producer. Producers are always photosynthetic organisms who can produce their own food by utilizing solar energy. The primary producers are plants and other photosynthetic organisms such as cyanobacteria. The next levels depict the consumers, which includes herbivores, omnivores and carnivores respectively. The herbivores are the primary consumers, whereas the secondary, tertiary and quaternary consumers are omnivores and carnivores. Likewise, there can be food chains from three to six levels. In spite of showing the feeding patterns, food chains also show energy accumulation as each level passes. The producers absorb one per cent of the solar energy and thereby store the energy as starch. Afterwards, the energy is passed on to each level of the food chain. Most of the food chains connect with each other and form a food web. Hence, the food web is a collection of interconnected food chains. Moreover, food chains can be categorized based on the nutritional relationships such as parasitic food chains, detritus food chains and grazing food chains, etc. Meat, fish, eggs and alternatives. Fat, oil, sugar and salt. The food pyramid is a key towards a balanced diet. It guides the consumer to healthy compositions of food types. Therefore, the food pyramid emphasizes eating the right food in the right quantities. The food pyramid is based on the different nutritional values of the food mentioned above categories. Thus, it recommends eating more fruits and vegetables, a moderate amount of meat, fish, egg, milk and alternatives and low amounts of sugar, oil and salt. What are the Similarities Between Food Chain and Food Pyramid? Food chain and food pyramid are important in nutritional biology. Both are concerned with the feeding and energy balance of the food. What is the Difference Between Food Chain and Food Pyramid? A food chain represents the linear relationship between organisms for food. On the other hand, a food pyramid represents the optimal number of servings to be eaten each day from each of the basic food groups. Therefore, the key difference between a food chain and food pyramid is that the food chain is not a quantitative parameter while the food pyramid is a quantitative measure. 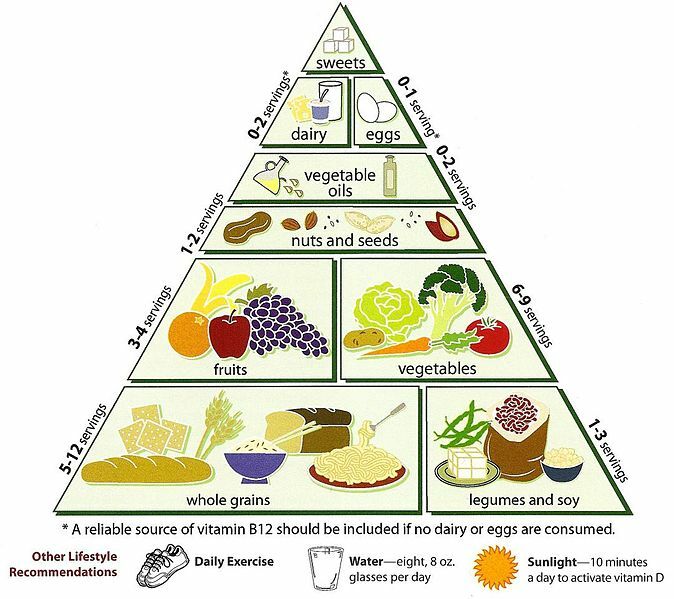 Furthermore, the fFood chain is a linear diagram while the food pyramid is a triangular diagram. So, this is also a difference between food chain and food pyramid. Moreover, a further difference between food chain and food pyramid is that the food chain shows the energy flow and feeding patterns in different organisms while the food pyramid shows the amount of food needed. 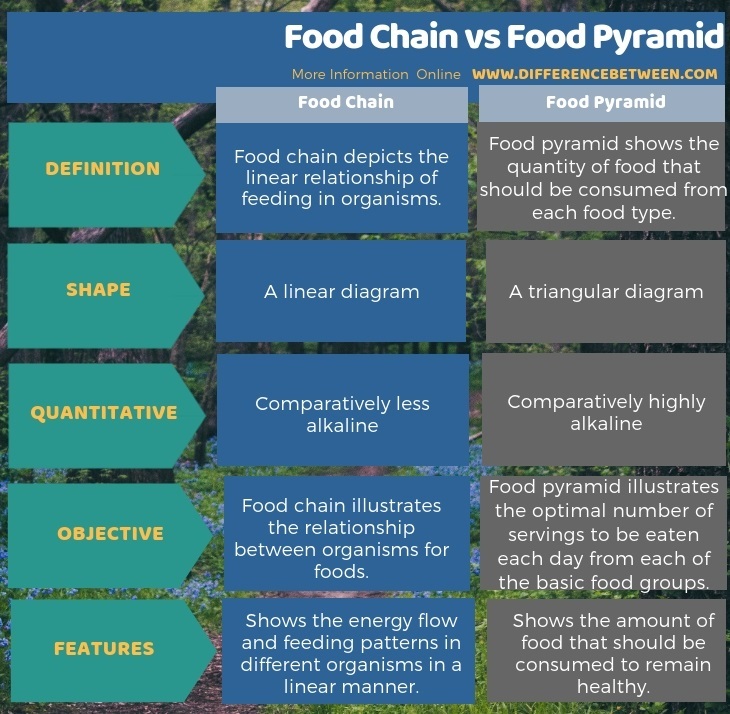 Below is an infographic on the difference between food chain and food pyramid that explains the differences in detail..
Food chains and food pyramids are important in nutritional biology. In summary of the difference between food chain and food pyramid, the key difference is that the food chain depicts the linear relationship between the organism’s feeding patterns, but in contrast, the food pyramid depicts the quantity and quality of food that should be consumed by an organism in order to live in a healthy life. The energy flow is an important component in both the food chain and the food pyramid.